Editors: Markham, Ian S., Hawkins, J. Barney and Terry, Justyn, et.al. 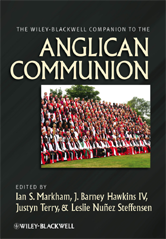 This uniquely comprehensive reference work provides a global account of the history, expansion, diversity, and contemporary issues facing the Anglican Communion, the worldwide body that includes all followers of the Anglican faith. 48 The Episcopal Church of Cuba A. Hugo Blankingship, Jr.